someone that is basically close to meet up and dive with. Welcome aboard! Good to see another Diver here and also to have another Diver with a Healthways reg.! Stick around long enough and you'll meet the other Healthways Divers. Unfortunately I'm living in Ohio, so can't help you out with the dive buddy quest. Welcome aboard matey. Hmmmmmm? I feel like I'm talking to myself... so are you a real Jay, or is it short for something else? Yump, I'm a real Jay, not short fer nuthin'! My wife and I live in the SF Bay Area, she also like the old gear! Ewww, you got my two fave DH's, anything Healthways, and the Dacor Clipper, I also have two; must be a Jay thing? Healthways is my main addiction, and I have a soft spot for oddball gear like White Stag. I have nearly the entire line of HW's regs. Yes, my real name is Jay, not short for anything, on questions, I have a serious one. 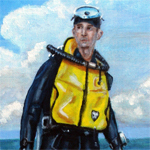 My scuba tank is always filled by the dive store to 3,000 psi, as normal, I usually use a single hose reg to dive and use up air to get it down to 2,200 psi, because, I was informed that at 3,000 psi it could damage my double hose regulators, is that true? Or was someone giving me wrong info? First, welcome here! I think we have one person here from Central Texas, 'Ol Mossback. Now, concerning your question about vintage regulators and tank pressures, there are a couple of things to consider. First, all vintage regulators were made to withstand 2475 psig, as all the original steel 72s were rated with a "+" and could therefore take up to 2475 psig. The U.S. Navy used their DA Aquamaster regulators at 3,000 psig, but in training we were told not to fill the tanks above 2150 psig. 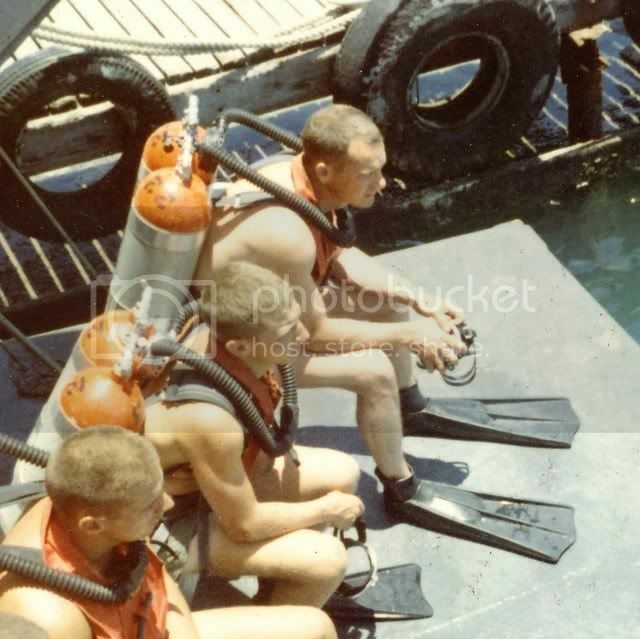 Here are my notes, taken at the U.S. Navy School for Underwater Swimmers in 1967, on the tanks we were using. Note that I think the reason for their restriction of 2150 psig was because we were filling both the Navy aluminum round bottom tanks and the steel 72s, and they didn't want us to mix up and fill a steel tank to 3000 psig. What I'm saying is that the DA Aquamaster, with its original yolk, was rated for 3000 psig from the U.S. Navy. Dacor has a hefty yolk on its original Dial-a-Breath regulators, but the thread size is much finer than the DA Aquamaster's threads. It never hurts to handle these old regulators with care, and not over-stress their yolks in any case. So Jaybird's recommendations are relevant, but I wanted to give perspective. The problems with vintage regulators occurred with the "Florida cave diver's fills" which were commonly to 3500 to almost 4000 psig. Jaybird's MR-12 regulator's yolk was made for 3000 psig, but probably had the Florida cave diver's fills to handle, and could not. That is why it cracked. It's good to see you here, and hope you will enjoy the company and continue to contribute. John, when I was at Steele's and I noticed he had a USN-non-mag, I asked to look at it. His non-mag didn't have a standard USD-yoke, so I'm wondering if that is why they were able to be able to use a higher-psig? It is also the kind built by USD, as it has the chemically blackened body, and not tinned and painted... Just my extra two-cents! Actually, we had both types of DA Aquamaster, the regular with a satin finish and the anti-magnetic with the black finish, at the U.S. Navy School for Underwater Swimmers in Key West, Florida in 1967. 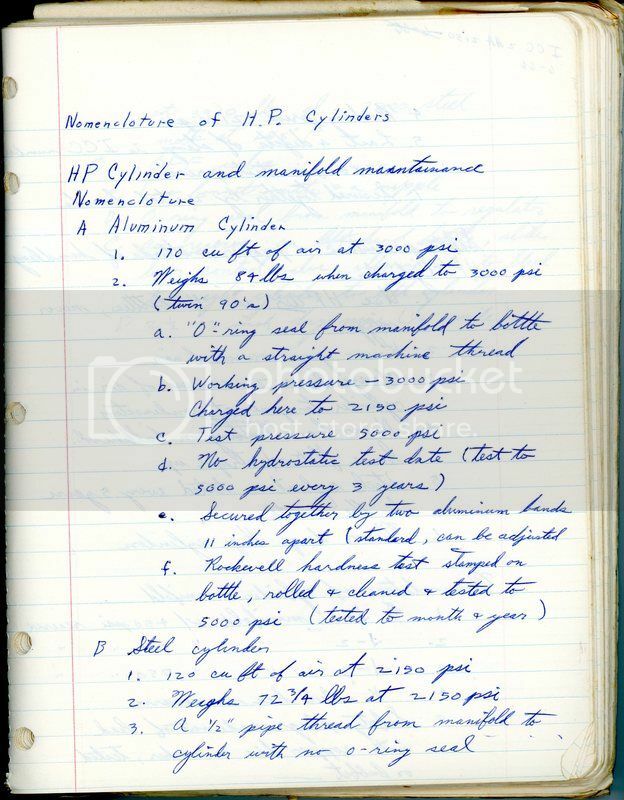 I have an interesting note on the page prior to this one I scanned, stating "Aluminum bottle used with lobo regulator." "LOBO" has a meaning, and I believe it is "low..." something, but I cannot figure out what the "BO" portion of that note stands for. It is a U.S. Navy acronym for the anti-magnetic regulator though. depend the temperature of the sample. Is it possible that the coating on the anti-magnetic regulators is SrCu2(BO3)2? Welcome Jay. I know what you mean when you say many diver look at you like you're crazy when you resort to diving tables or, God forbid, vintage gear! 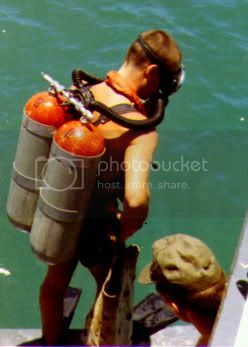 It took me some doing but I have convinced a fellow diver to use a DH from time to time, as well as other vintage gear. Yesterday we did a couple dives in Lake Superior for example. I used my Dacor Olympic from the 70s and the three other fellows didn't even blink. The water was a crisp 36 degrees and I know that reg performs very well in cold water. If any of my 72s were full I'd probably have used a DH, but all I had that was full was an aluminum 80. Good luck converting some of your fellow locals. Keep a positive mind set and don't give in. You may just make believers out of some of them. Let us know how it goes down there. Welcome Jay. I know what you mean when you say many diver look at you like you're crazy when you resort to diving tables or, God forbid, vintage gear... Keep a positive mind set and don't give in. You may just make believers out of some of them. Let us know how it goes down there. BTW when I was at Steele's a few months ago, I saw a brand new incarnation of the first stage used on the Healthways Scuba Star. Mind you it had a swell satiny gun-metal finish, and a more robust yoke, but it's unmistakable! Like Don says, the "core group" of Divers I know by now "expect" me to use vintage kit, it is "normal" for me now. 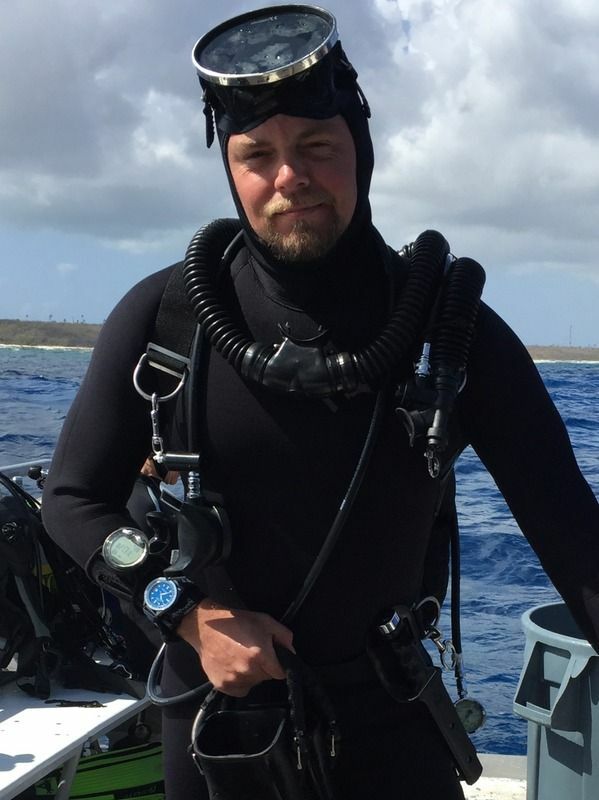 Now when I go diving on a weekend and there are a lot of others there that only dive on weekends I might get a few stares, questions, etc. I still think it is funny when I as a newer Diver has to explain to a more experienced Diver what the J-Valve Rod on my tank is and what it does... I'm to the point where I don't care what others think. Hi Jay, I'm fairly new here too...but welcome! I'm not sure where you are in central TX, but I'm in NW Louisiana (Shreveport) so a lot closer than many members here. I haven't been diving a double-hose for long, only a couple of months, but all of my reactions have been positive. I've had mine in Grand Cayman, Cozumel, Roatan, and Costa Maya, Mexico and every diver, dive master, boat captain and dive shop owner has thought it was all pretty cool. I'm not in full vintage, just retro, so maybe that has something to do with it. Either way, sounds like you have some great equipment, and as long as you're enjoying the hobby, it doesn't matter what the others think. I've dove Travis, but that was back in '04. What I remember most is that we were near the dam, down at 120 ft on tri-mix, and there was no thermocline. It was dark, but just as warm at 120 as it was on the surface. It was crazy. Austin is a cool town, that I don't visit often enough. My wife and I were there back in the fall for a weekend getaway, and hit some great restaurants. Perla's was our favorite, as it just has a cool vibe. When you say "Lake Athens", are you talking about Athens Scuba Park?